LAKEVILLE, IN. 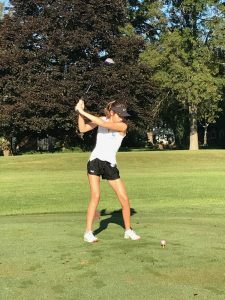 – The LaVille Girls Golf team might have had two players this season, but coach Lindsay Garrett and both golfers agree that a lot of improvement was made by each golfer this season. Junior Taylor Garrett, Lindsay’s daughter, and classmate Elizabeth Howard, talked about their season and the parts of their respective game that improved. Howard, meanwhile, found that changing her focus helped her relax before a shot. 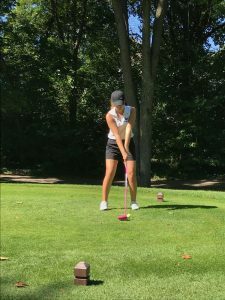 Howard said: “My best match of the regular season was against Tippecanoe Valley and I shot a 65.”As the season came to a close, both Taylor and Elizabeth participated in the Penn Sectional at Knollwood Country Club in Granger, IN. Howard shot a season-best 127 in the sectional round. Coach Garrett summed up the season, the experiences, and how she was able to help the Lancers.